This is a wild Buzzard. It doesn't belong to anybody, there isn't a man waiting in a field below with a gauntlet on his arm. 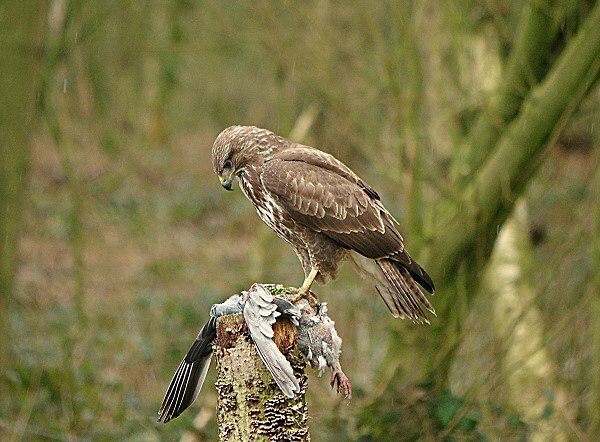 The farmer shot some pigeons, and my mate and I put a couple out on some tree stumps near to where we were hidden and then we waited, and waited and waited till the Buzzard decided it was feeding time and dropped down (briefly) to have a look. I got three shots of it from about 30 feet away and my mate got one before it flew off into the trees, just above and slightly out of range of my camera and sat there for about 15 minutes before it moved....and then it flew to another branch in another tree just out of range. Then it flew down again after about another 15-20 minute wait, flew over the dead pigeon and went and sat in another tree, just out of range...with it's back to us, before it flew off again. See the other shots of it high in the trees (not cropped) taunting us!